Hot foil stamping machines are indispensable in a variety of industries both in the United States and abroad. The need for reliable and versatile presses and stamping machines is undeniably the first thing that many companies need to deal with in order to be productive. These features are exactly what precision industries are looking for and this is also what BOBST has to offer. Hot foil stamping, folding, gluing and die cutting is the heart of every Laser AG premium packaging printer. This industrial-sized printer uses the latest BOBST technology which means quality in hot foil stamping, precision in folding and gluing and the most efficient in die-cutting. These machines are expected to boost the productivity of any industry. Laser AG printers are considered one of the best quality industrial printers that have a variety of capabilities. In hot foil stamping for instance, which is needed in a variety of industries locally and abroad, Laser AG has three BOBST machines. A VISIONFOIL 104 hot-foil stamping machine, a MASTERFOLD folder-gluer and an EXPERTCUT 106 per flat-bed die cutter. These machines are the ultimate all-in-one solution for hot foil stamping along with die-cutting and stripping. They can save business owners hundreds of dollars over buying three individual machines. This has a stamping format of up to 1,010 x 702 mm while the VISIONFOIL 104 has a 70/100 format throughout. This machine is expected to be the heart of the production line for a variety of industries. These include the manufacture of cosmetics, food stuffs, chocolate, champagne, car parts and many more. It is efficient too with an output of 5,000 sheets in an hour in full format with eight foil webs. 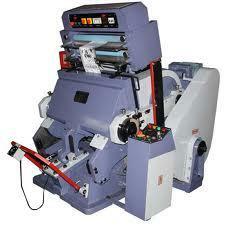 Along with the mentioned uses of this printer, a die-cutter and folder-gluer increases its flexibility even more. The MASTERFOLD has an accessory called SPEEDWAVE GT device that can boost the machine’s work by working a folder-gluer. This is an ideal accessory that is handy in folding and gluing lock-bottom boxes at maximum speed. Even boxes with unusual openings and irregular shapes will work with this accessory. Approximately 3,000 different types of boxes can be folded and glued. This includes cardboard boxes, solid board boxes, corrugated board and even plastic boxes. Folding, gluing and die-cutting machines offer increased versatility in most industrial applications. Since this machine offers a wealth of possibilities it has been chosen by more and more local and international companies. This is a change from obtaining separate machines to work on each function. It does not just improve production, but can also save space and reduce the need to hire more employees or operators as well as reduce maintenance costs. These are truly indispensable machines that will serve a multitude of purposes for years to come.